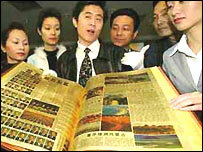 China has published the world's first gold newspaper, Xinhua news agency reported. The most expensive edition uses 500 grams of gold and costs 69,000 yuan ($8,100), while another uses 200 grams and costs 29,000 yuan ($3,500). The paper has been published by the China Economic Daily to celebrate the achievements of the last 10 sessions of China's top legislative body. It was issued in the city of Shenzhen, a booming economic centre in the southern province of Guangdong.